Spotted a few mentions of this place but no dedicated thread, so here goes . . .
6 of us had a surprisingly delicious dinner here over the weekend. I'd seen some images of the food and it looked mighty fine but for whatever reasons, my expectations were low. I should not have been concerned. Saturday night, 8:15, restaurant was full and bustling. Nevertheless, our reservation was honored immediately as we walked in, and none of that ridiculous 'your entire party must be here before we can seat you' business. I enjoyed them all but I was most pleased by the soup, the ezme and the hummus, the latter of which was longer on cumin and shorter on garlic than what I usually encounter. Still, it was flavorful, with a satisfying texture (not too tight or too loose). Similar to most of our meal (including the part that followed), these dishes were all well-seasoned -- but not aggressively so -- and offered layers of flavor. This was particularly true of the lentil soup, which packed a smile-inducing amount of flavor, even though it was vegetarian. It was a pleasure to eat these unfamiliar takes that I could appreciate on their own and and easily compare to other versions I've had. Delicious, super tender and falling off the bone, this braised haunch was a Flintstones-size portion. The mashed potatoes were also great. I opted for those since we were getting a side of bulgur with one of the other entrees. The generous, grilled lamb chunks were perfect - crusty outside, and juicy and tender inside. The eggplant puree atop with the lamb was served was smoky, smokier, in fact, than the baba ganoush. More expertly-cooked meat wrapped in a combination of delicious ingredients. The aforementioned side of bulgur was toothsome, nutty and delicious. In spite of being breast, this was quite moist, and also very flavorful. I especially loved the kurdish cream sauce. Nicely marinated and tasty beef, even though I probably would have preferred the beef a bit less done. But I think cooked-through is just the nature of the dish. Happily, the marinade kept the meat flavorful, and the vegetables were a great accompaniment for it. We shared two desserts, the Dark Chocolate Belgian Cake and Rice Pudding & Apricot. I thought both were quite good. The delicious, creamy and rich ganache on the cake offset a minor bit of dryness with the cake itself. The rice pudding, a thick rendition that stood freely on the plate in quenelles, was quite good, and the apricot was in the form of a honey-like sauce that was used to decorate the plate. 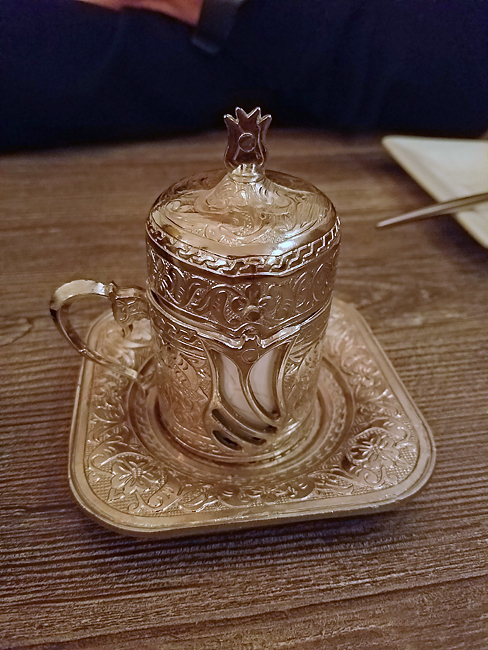 My tablemates ordered and raved about the Kurdish coffee, which is made from roasted pistachios and served in very beautiful little cups . . .
As I mentioned above, when we arrived the place was at maximum capacity. It was loud but not to the point where conversation was impaired. Our server did a great job of deftly moving around the table so she could converse with each of us as was necessary. And btw, she was quite competent, with a deep, solid knowledge of the menu. The space is comfortable and attractively decorated. We never felt rushed or hurried, even at the end of our meal, when we were among only two or three tables that were still occupied. I don't get to this part of town too often but it's an area that's often maligned for not having any genuine or great eats. I think The Gundis throws that assertion completely out the window. And, the lunch and brunch menus look great, too. I'll definitely be back. I haven't tried dinner, but I love this place for the Kurdish brunch...so much fun and such delicious food. Olives, cheeses, bread, sesame butter (my favorite part), honey, apricot and cherry jam, fried cheese rolls, potatoes, your choice of eggs (we always go with the soujouk - spicy beef sausage). The little trays just keep on coming. And they keep pouring more tea. You've got to be really hungry and you probably don't need to eat any more that day after you're through. It's an experience. We love taking out of town guests...it's a sight to behold. bon2mic wrote: . . . bread . . .
Yeah. I forgot to mention that our appetizers were served some small, domed, round loaves, maybe 3-4" in diameter, that seemed liked they'd been baked very recently, and were very tasty. Some ultra-thin, cracker-like breadstuffs were also served. Brunch looks like a serious feast. Is it typically pretty busy then? I'm glad to see some posts about this place. I went for dinner and liked but did not love my food (it has been a yearish so I do not remember the details), but like bon2mic, I was pretty impressed by the brunch offering - specifically The Kurdish Breakfast for two. It was, indeed, a feast and very tasty. We got 1 for every 2 people at our large party table and we had a groaning amount of food. Things came out in multiple courses. I remember enjoying the mezze-style cheeses and jams in addition to the cooked dishes. I was there with a large party and it was later on a Saturday (like 1-2:30ish) so I cannot extrapolate to how busy it might be during peak times, but I believe it was not too crowded. Last edited by gastro gnome on November 6th, 2018, 5:26 pm, edited 1 time in total. It's usually relatively full but they take reservations which are usually available the day or two before if you know a little in advance that you want to go. That said, I haven't seen it so full that there's a line any of the 4 times we've gone. The breakfast they have with the cheese, vegetables, etc is the closest thing I've had in America to many breakfasts I've had in Turkey. Other places will kind of do it too, but it's not on their menus and they'll be very surprised when you ask for it if you aren't from that part of the world. So for that alone, I really like Gundis apart from the fact that their other food is pretty legitimate.